I’m not entirely sure, but I think there is something very wrong with the world. My watch is still on British summer time. It’s early October. In fact we’re not quite a full week in to the month yet. On the calendar there is Halloween coming up in 3 weeks time. Guy Fawkes coming up not long after that. And then there will be December and Christmas. Oh, I forgot to mention. On one of their 32″ TVs they are playing a DVD of the staff from the store singing Christmas carols. Not that you would call them professional singers, but they are giving it a go. There are also little stick on Christmas trees on the customer service desk. Some creative buggers have taken a bunch of the bags for life and made giant five meter tall Christmas tree silhouette on the windows. And to keep the theme going, the white support pillars on the out side of the building near the cafe overlooking the canal have been wrapped in huge spiraling ribbons to look like sugar canes. It’s eleven weeks till Christmas. 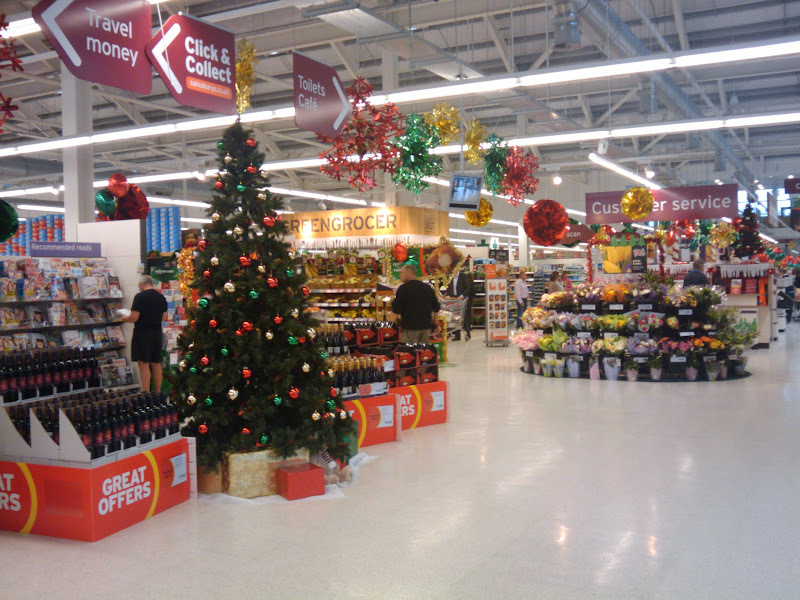 Thanks to Sainsbury’s I’ll be sick to the high teeth of the sight of Christmas within 6 weeks I would think. Wasn’t there some sort of tradition of the decorations going up some time in December? I remember being told that the decorations needed to be taken down the by the twelfth night. But this just feels like one massive piss take. I don’t know, I really don’t. May be this is the early on set of Grumpy Old Man syndrome.